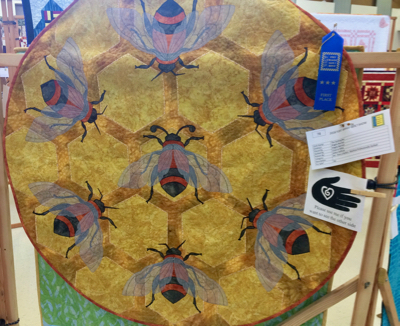 It was time for the annual quilt show, something I look forward to each year. The exhibit is held in the elementary school in the Big Town. Even though school is out, and my school days are long behind me, there’s something about being in a school building that just takes you right back to those days. You practically expect to be taken to the principal’s office for walking the halls without a pass. When Megan lived with me during high school and I went to her parent-teacher meetings, I always felt like an imposter who would be told I was not a real grown up and be forced to go back to school. Fortunately, this waking nightmare never came true. 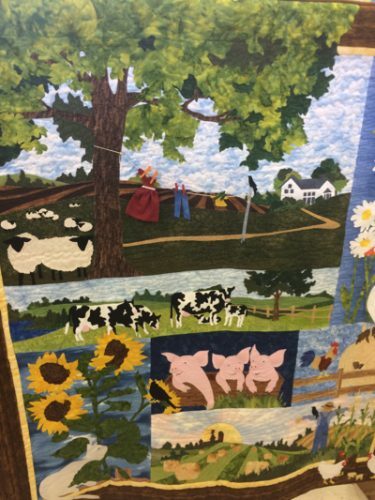 Once we got to the quilts, those thoughts vanished as we admired our neighbors’ handiwork. No matter how long I live here and how many exhibits I attend, I will never get over how many talented artists live here. 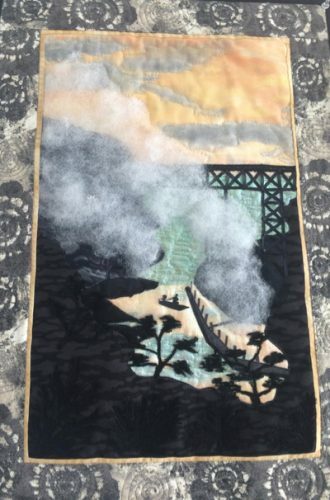 This one featured the Hooterville Bridge, accessorized with a glamorous wisp of silvery fog, which was unfortunately lacking on that scorching day, when it was 90 inside my house and was still 86 when I went to bed. Is it any wonder I start dreading summer in February? 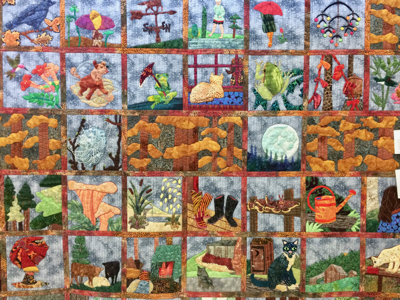 This quilt celebrated the joys of winter weather, when a girl can sleep in comfort beneath a quilt and blankets. I like how the fabric looked like rain in the background, along with mushrooms, frogs, a cat looking out of the window, and rain boots. So cozy! This barnyard scene was charming. I wish I had taken a better photo of it. There are actual tiny clothes flying from the clothesline! 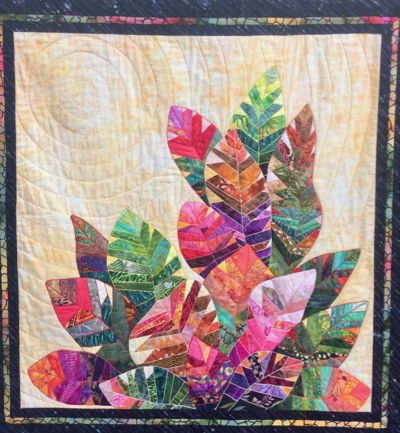 This bright piece reminds me of Hawaii and the tropics. Each stripe is an individual piece of fabric. This was a nice companion piece to the Hawaiian piece. I think it was called a dragonfish. I thought it was exotic looking and striking. 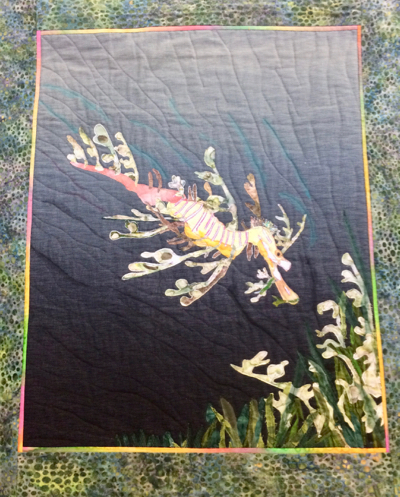 This cat quilt was clever, too. 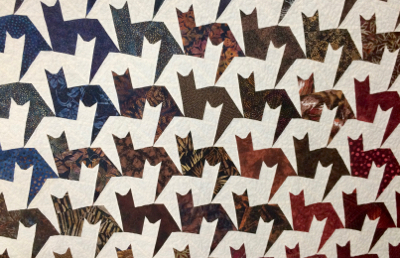 The cats were all cut out and pieced by hand. What could be cozier than cats and quilts? It was on sale! 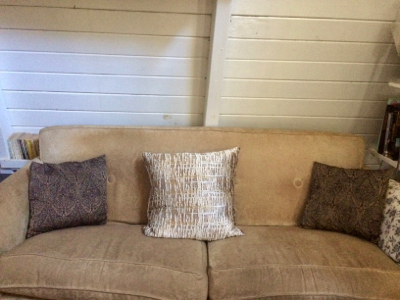 And it looks very nice with the beaded pillows on the side. In real life, you can see the sheen of the beads. It is very comfortable as well for the rare times I lounge on the couch, and it has already received the kitty seal of approval. On our way home, we stopped off to get more wood-fired pizzas in the Village, sitting at a little table in the shade while we waited and petting an adorable dog named Lola. It hasn’t taken us long to add the pizzeria to our favorite spots. When we got home, dinner was ready! A YEAR AGO: Cherries from our tree! FIVE YEARS AGO: Everyone was feeling better. TEN YEARS AGO: Braving the traffic to see Stevie Wonder. What beautiful pieces of art, people do not realize how much work is involved in making these beauties, glad you were able to enjoy and appreciate the work. Nice day for you guys and ending up with a wood-fired pizza, another great favourite. Thanks for sharing.